When we look at the latest car models we want fast cars, all-terrain cars or cars to fit the whole family. What about an environmentally friendly car? Shopping can be confusing at the best of times, and trying to find environmentally friendly options makes it even more difficult. Welcome to the second instalment of our Sustainable Shopping series, in which we ask experts to provide easy eco-friendly guides to purchases big and small. Cars are vital to Australians. As of 2016, we have 18.4 million registered motor vehicles, producing vast amounts of carbon dioxide from the combustion of fuels.. The harms of CO₂ emissions from fossil fuel burning have been hammered home time and time again: they are the main driver of global warming and sea level rise, and they harm vulnerable communities. So how can our choice of car minimise these devastating outcomes? Without reducing road transport emissions , the Australian Government will find it difficult to meet our climate target of a 26-28% reduction on 2005 emission levels by 2030. A simple way to reduce transport emissions significantly is to guide consumers towards more fuel-efficient vehicles. Many other countries have minimum national standards for new cars, but no such targets currently exist in Australia. This means global car manufacturers can dump high-polluting cars, which can’t be sold in countries with stricter regulations, into the Australian market. The most fuel-efficient, low-emission vehicles offered in Australia are on average less efficient than those offered in other countries with fuel efficiency standards. Car manufacturers offer those vehicles that are cost effective to supply and maximise their profit in the Australian market. Internationally, this makes Australia a laggard when it comes to energy efficiency in the transport sector, ranking last out of 16 major OECD countries. How can we increase sustainability? The federal government has proposed a set of fuel-efficiency and CO₂ emission regulations, to be introduced by 2020. The regulations will encourage car manufacturers to import and promote the most fuel-efficient models. Evidence shows that motorists’ vehicle choices play a key role in decarbonising the transport sector. 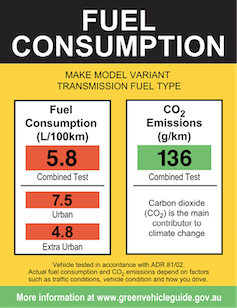 The current Australian fuel consumption label is confusing and doesn’t give people enough context. 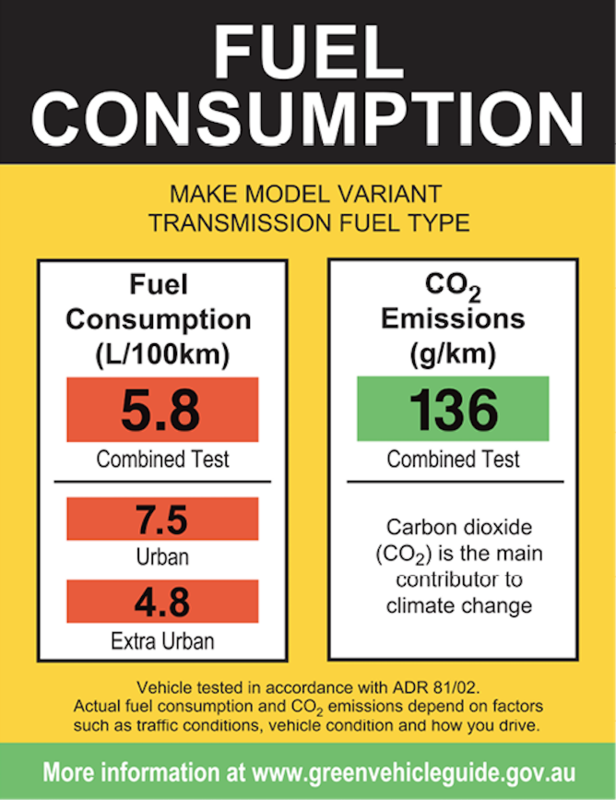 But as it stands, if you want to make an informed choice about your new car, you generally have to rely on the mandatory fuel-efficiency and CO₂ emission labels (displayed on all new cars), and information provided in the Green Vehicle Guide. Unfortunately, current car labels can be very confusing, presenting numbers with very little context. There is a simple way to make this labelling more effective, which other countries have done very well: rate vehicles against a benchmark. 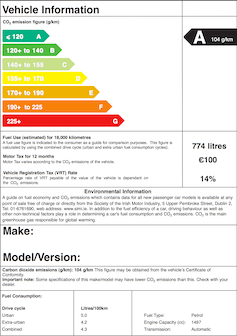 The Irish fuel label, for instance, includes colour-coded bands to rank CO₂ emissions, and an estimate of the amount of fuel needed to travel 18,000km. Buyers can tell at a glance if a score is good or bad, and thus easily compare models. Irish fuel consumption labels are well recognised and easily understood by consumers. Irish car labels also tell buyers about the vehicle’s registration tax (stamp duty), which varies based on its CO₂ emissions. The best starting point when buying a new car is the Green Vehicle Guide, which gives you the CO₂ emissions intensity for each model. Let’s say I really want a fuel efficient medium-sized SUV. Searching in the Green Vehicle Guide will lead me to the Mitsubishi Outlander (petrol-electric) hybrid, which emits 44g of CO₂ per kilometre. I can see that’s better than the other SUVs detailed in the guide, but I want some more context. My next step is to look at the Carbon Dioxide Emissions Intensity report by the National Transport Commission, which will give me an idea of how the Mitsubishi measures up against other new vehicles in Australia. That report is a whopping 66 pages long, but the graph below is on page 21. It shows the range and average of CO₂ emissions of 2015 vehicle models, so I can see that the average medium SUV emits 175g per km, and the upper limit is over 250g per km. The Mitsubishi is therefore a pretty sound choice – it’s actually under the average emissions of all classes of new vehicles. The average and the range of carbon dioxide emissions intensity of car models during 2015. 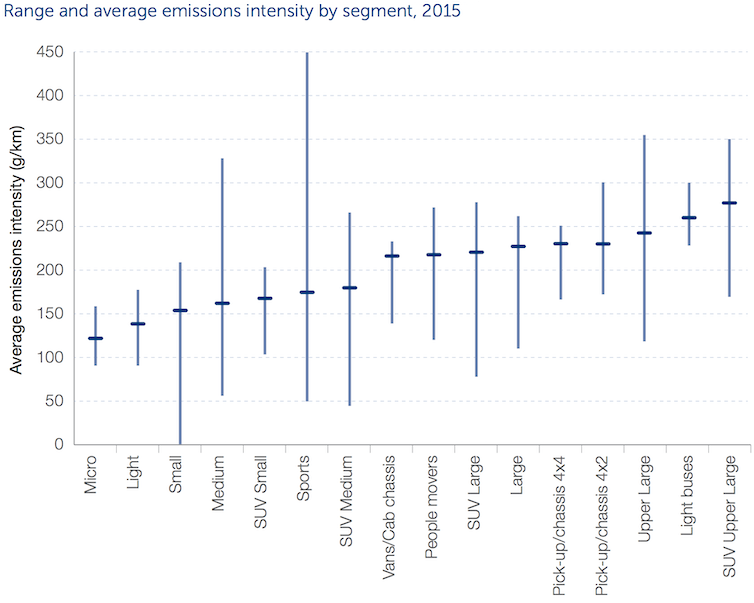 The average emissions are represented by the horizontal lines and the range of emissions are represented by the vertical lines. 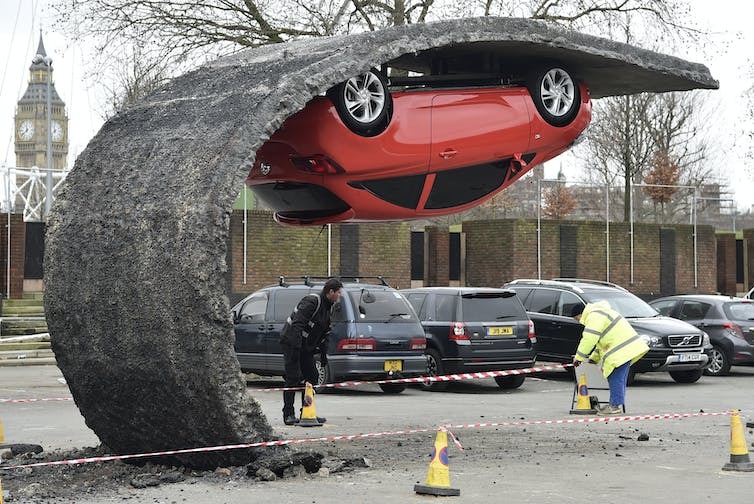 Ideally, finding a less environmentally damaging car would not take this much work. The Green Vehicle Guide should compare all categories of new vehicles against the “best in class” chart on page 22 of the Carbon Dioxide Emissions Intensity report. Better still, manufacturers should have to provide this information in an easily understood way on each car they sell. Such rankings would inform people whether the vehicle they are choosing is an eco-friendly brand, and put pressure on manufacturers to improve their Australian offerings. Making it easy to find greener cars can have a big impact. If all Australians buying a new vehicle in 2015 had picked the “best in class” for their model, the national average for new car CO₂ emissions that year would have been 55% lower. The government can help the environment and consumers by following the European Union’s example. This would mean imposing better industry standards and raising consumer awareness by providing information on car labels that is easily understood and transparent, such as ranking vehicles against colour coded CO2 emission bands. Until then, a little information and some homework can help you find the most eco-friendly vehicle for your needs.